UrhoSharp can be programmed with F# using the same libraries and concepts used by C# programmers. The Using UrhoSharp article gives an overview of the UrhoSharp engine and should be read prior to this article. Like many libraries that originated in the C++ world, many UrhoSharp functions return booleans or integers indicating success or failure. You should use |> ignore to ignore these values. The sample program is a "Hello World" for UrhoSharp from F#. From Visual Studio for Mac, create a new Solution. Choose iOS > App > Single View App and select F# as the implementation language. Delete the Main.storyboard file. Open the Info.plist file and in the iPhone / iPod Deployment Info pane, delete the Main string in the Main Interface dropdown. Delete the ViewController.fs file as well. You are now ready to begin defining your game's classes. At a minimum, you will need to define a subclass of Urho.Application and override its Start method. To create this file, right-click on your F# project, choose Add new file... and add an empty F# class to your project. The new file will be added to the end of the list of files in your project, but you must drag it so that it appears before it is used in AppDelegate.fs. Add a reference to the Urho NuGet package. From an existing Urho project, copy the (large) directories CoreData/ and Data/ into your project's Resources/ directory. In your F# project, right-click on the Resources folder and use Add / Add Existing Folder to add all of these files to your project. 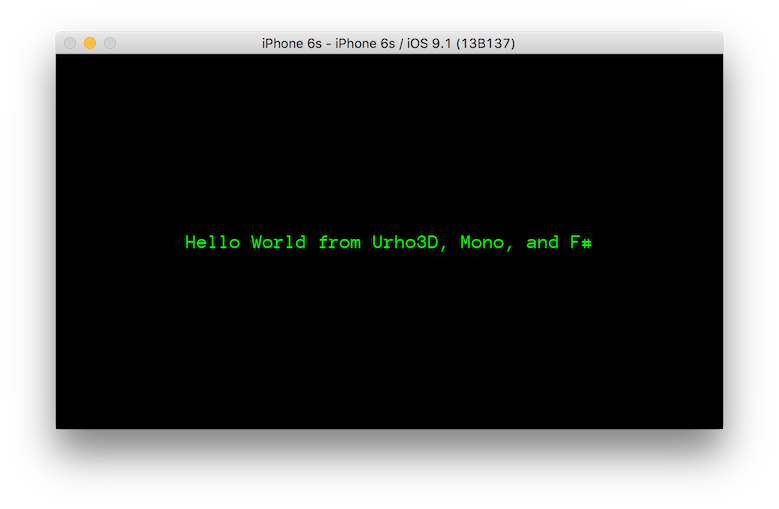 helloText.Value <- "Hello World from Urho3D, Mono, and F#"
The code is very straightforward. It uses the Urho.Gui.Text class to display a center-aligned string with a certain font and color size. Before this code can run, though, UrhoSharp must be initialized. The ApplicationOptions.Default provides the default options for a landscape-mode application. Pass these ApplicationOptions to the default constructor for your Application subclass (note that when you defined the HelloWorld class, the line inherit Application(o) calls the base-class constructor). The Run method of your Application initiates the program. It is defined as returning an int, which can be piped to ignore.